Unless you live under a rock, you have heard something about the NFL catch rule over the last few days. “He caught it.” “What a stupid rule.” “Quit crying.” Or something to that extent. 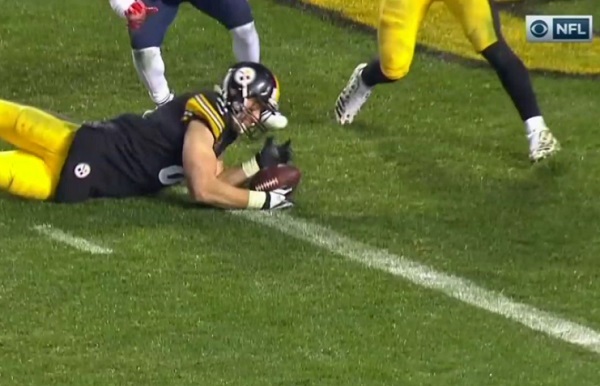 Jesse James caught an apparent game-winning touchdown for the Pittsburgh Steelers against the New England Patriots. Steelers fans everywhere went nuts. Even when they showed the replay Jim Nantz and Tony Romo were still dropping the ball (pun not intended). They thought the refs were checking whether or not James made it into the end zone. After reviewing it about ten times, Romo finally realized what the refs were looking at. The ball came loose while James was going to the ground or “completing the catch” as you may have heard. Take a look. Let NFL Football Operations break it down for you. Let this smart man break it down for you as well. The ruling had nothing to do with “breaking the plane” or “getting in the end zone.” It was ruled incomplete. Whether or not James was in the end zone was irrelevant to the ruling. Item 1. Player Going to the Ground. A player is considered to be going to the ground if he does not remain upright long enough to demonstrate that he is clearly a runner. If a player goes to the ground in the act of catching a pass (with or without contact by an opponent), he must maintain control of the ball until after his initial contact with the ground, whether in the field of play or the end zone. If he loses control of the ball, and the ball touches the ground before he regains control, the pass is incomplete. If he regains control prior to the ball touching the ground, the pass is complete. You may have heard many announcers say this was a touchdown in high school football or College Football Why is that? Well that’s because in those leagues runners don’t have to be touched to be declared down. Tony Dungy said this loud and clear on Sunday Night Football. So what is the rule in college football? 4. Satisfies paragraphs b, c, and d below. b. If a player goes to the ground in the act of catching a pass (with or without contact by an opponent) he must maintain complete and continuous control of the ball throughout the process of contacting the ground, whether in the field of play or in the end zone. This is also required for a player attempting to make a catch at the sideline and going to the ground out of bounds. If he loses control of the ball which then touches the ground before he regains control, it is not a catch. If he regains control inbounds prior to the ball touching the ground it is a catch. So this begs the question. Would this have been a catch in college football? If a player goes to the ground in the act of catching a pass (with or without contact by an opponent) he must maintain complete and continuous control of the ball throughout the process of contacting the ground, whether in the field of play or in the end zone. This is also required for a player attempting to make a catch at the sideline and going to the ground out of bounds. If he loses control of the ball which then touches the ground before he regains control, it is not a catch. If he regains control inbounds prior to the ball touching the ground it is a catch. So if you go by the official rulebook, this would not have been a catch in NFL or College Football. Tony Dungy was wrong. The glaring difference between the NFL and College Football ruling is that a player needs to get only one foot down inbounds. Am I wrong? I’d love to hear about it. Tell me your thoughts in the Facebook comments section.